With these pro secrets, including celeb nail artist Miss Pop’s top tricks, you can create salon-worthy nail art at home! One of the best things about nail art, besides the gazillian likes on your #ManicureMonday post, is experimenting with different looks and designs. With these pro secrets, including celeb nail artist Miss Pop’s top tricks, you can create salon-worthy nail art at home! 1. Use a sponge to create a cool ombre mani. Start by painting your nails with the lightest color as your base. On a flat surface, swirl the two polishes together with a toothpick. Dab a sponge onto the polish a few times, and blot onto your tips. 2. Use a Sharpie to create streak-free designs. Apply a base color; then use a thin sharpie to draw straight on your nail polish for cool DIY designs. 3. Use paper reinforcements to create a flawless half-moon mani. 4. Use a rubberband to create a perfect French manicure. Tie a rubberband in the middle. Loop one end over your thumb to create tension on the band, and align the other end over the top of your nail to create the French tip shape. Voila! You’ll have a curved line to use as a stencil as you paint the tip of your nail. 5. Soak your tips in ice water after you paint them to speed up drying time. 6. Make your mani last longer by swiping the edge of your nail with a clear topcoat. 7. Make your own glitter polish by mixing your fave craft store glitter with a clear topcoat. 8. 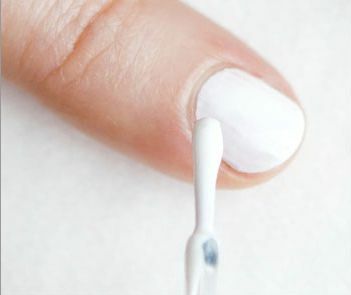 Use a tiny paint brush to tidy up your mani. The best way to remove any extra polish that gets on your cuticles is by dipping a small paint brush in nail polish remover. You won’t have any fuzzy hairs (like a cotton swab can leave behind), and the bristles can get in between the side wall and nail more easily. 9. Apply a white base coat to make neon polishes seriously pop. 10. Invest in a fan brush for a cool, striped look. 11. Use the tip of a bobby pin to make polka dots! 12. Create a cool textured effect with a paper towel. Simply paint some polish onto the paper towel, then dab it down onto your dry manicure. 13. To remove stubborn glitter polish (or gels), grab some foil. Soak a cotton pad in acetone nail polish remover, place it on your nail, and wrap your nails in foil for 10 mins. 14. Use blue painters tape as a stencil to create flawless designs. Unlike other tape, it comes right off without sticking to the polish on your nails. 15. Apply studs or rhinestones with a toothpick. Dip the tip of an orange stick or toothpick into your topcoat. It will pick up the stud, and give you the control to place it wherever you want on the nail.